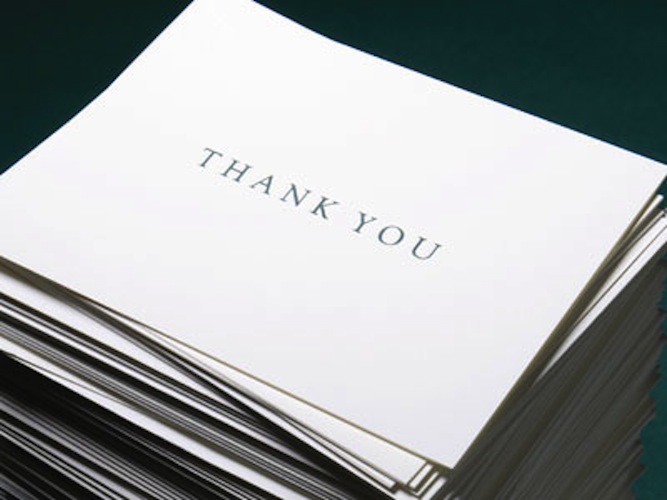 If Gary Vaynerchuk is right, and the next big thing in business is simply to say thank you, then ThankThank Notes is a genius idea. Even if he’s wrong, it’s still a great idea that should have been done before. ThankThank Notes is a startup that, simply, makes it easier for you or your business to send out hand-written thank you notes. Regardless of reason, and with a ton of customizable options, ThankThank Notes gives you a three-step process between visiting the site and your notes being sent on your behalf. Born out of practice, ThankThank Notes is the brain child of Kristen Carney, the founder of Cubit. While sitting around one day trying to figure out how to continue to send out hand-written thank you notes to Cubit’s clients, Carney and her partner Anthony Morales decided to put a lean startup idea into action. Eight hours, spent on a Sunday, brought about the web application for ThankThank Notes. A few days and three customers later, Carney and Morales realized that they were truly on to something special. What was born out of the Sunday session was a startup that managed to clear its own cost in only 3 weeks. Customized, handwritten notes are truly remarkable in this age of IMs and emails. But who has time to sit down and write them? Now, you do. All it takes is for you to head to the ThankThank Notes site, insert your information and pay for your order. Need to include a coupon or something special? All you have to do is ask. The ThankThank Notes “army” will go to work getting your notes sent out in a timely manner. The other thing that impresses us about the site is its blog. Not only can you keep up with what’s going on in the company, it also offers some interesting insights into what inspires them and how important it is to maintain that personal relationship no matter the size of your business. Pricing for the service is very reasonable at $3 per note. Beyond that, ThankThank Notes is still taking suggestions on things that it can do to provide a better, more usable service. So, drop by and give it a look. We’re interested to see what you think about it. Read next: Yahoo! CEO: "We have no interest in getting rid of Alibaba"